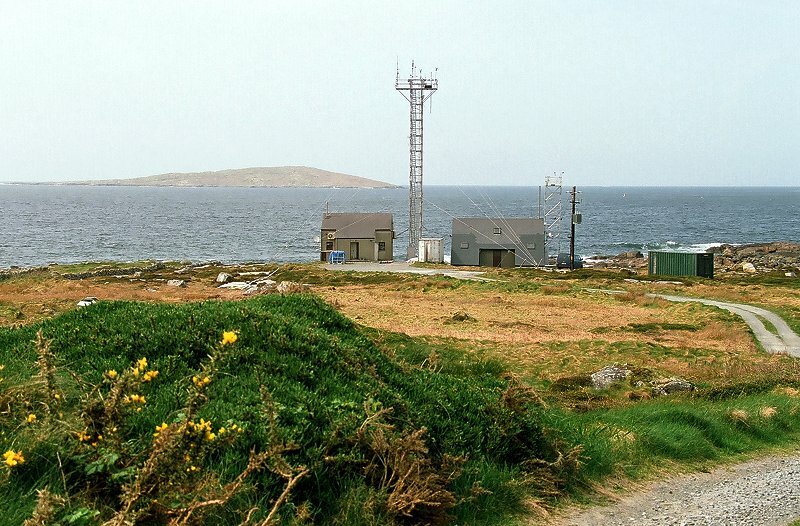 Located on the west coast of Ireland, the Atmospheric Research Station at Mace Head, Carna, County Galway is unique in Europe, offering westerly exposure to the North Atlantic ocean (clean sector, 180 degrees through west to 300 degrees) and the opportunity to study atmospheric composition under Northern Hemispheric background conditions as well as European continental emissions when the winds favour transport from that region. The site location , at 53 degrees 20 minutes N, 9 degrees 54 minutes W, is in the path of the mid-latitude cyclones which frequently traverse the North Atlantic. It is 88 km west of Galway city (population approximately 60,000) which is the nearest major conurbation. The main Atlantic shipping routes are over 150 km away, while the transatlantic air corridors are over 80 km away. There are three small islands offshore which are within the clean sector, but these are uninhabited and do not appear to influence any of the measurements made at the site. The meteorological records show that on average, over 60% of the air masses arrive at the station via the clean sector. These air masses are ideal for carrying out background aerosol and trace gas measurements. Significant pollution events also occur at the site when European continental air masses, generally originating from an easterly direction, reach Mace Head. 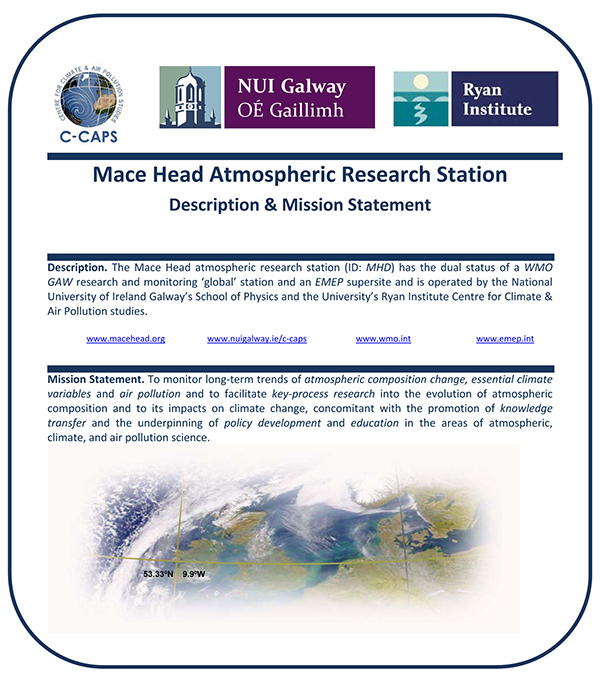 The Mace Head research station, is uniquely positioned for resolving these different air masses and for comparative studies of their constituents and characteristics. The climate is mild and moist, being dominated by maritime air masses. From collected data we see the distribution of mean hourly wind direction in 10 degrees intervals from June, 1990 to August, 1994 which shows that, for this period, the wind was within the clean sector for 50.6% of the time, this amount varying annually from 44.9% (1993) to 55.3% (1992). Calm conditions (average 0.6% for this period) are not included in the calculations. Annual rainfall is approximately 1200 mm. October to December are the wettest months, with April and May being the driest. Relative humidity is generally high, at about 80-85%. Average air temperature is about 10 degrees Celsius (~15 degrees Celsius in summer, ~5 degrees Celsius in winter). Sea temperature ranges from about 10 degrees Celsius in winter to about 15 degrees Celsius in summer. Sunshine is scarce, averaging 1290 hours per annum. May is the driest and sunniest month (179 hours), and December is the dullest (38 hours). Other ancillary constructions include a 10 m meteorological tower and platforms for the positioning of sampling equipment. Meteorological data such as wind speed, wind direction, pressure, temperature, relative humidity and rainfall are recorded at the station. Solar radiation and UV levels are recorded continuously. The facilities at the site consist of three laboratory buildings, one at ~300m and two at ~90m from the shore (~50m from high water), 23m and 10m aluminium walk-up towers and a converted 20 ft cargo container laboratory. The site is a part of a number of international research networks including the Advanced Global Atmospheric Gases Experiment (AGAGE), the Atmospheric/Ocean Chemistry Experiment (AEROCE), World Meteorological Organisation/Global Atmospheric Watch (WMO/ GAW), Tropospheric Ozone Research (TOR, a EUROTRAC project), Budget of Ozone over the Atlantic (BOA) and the Climate Monitoring and Diagnostics Laboratory/National Oceanic and Atmospheric Administration (CMDL/NOAA) co-operative flask sampling network.